Brian, Ron, Champ, and Brick are back together. The movie grows closer and closer with every passing day. December 20th marks the return of the world’s best news reader, Ron Burgandy, to cinema screens around the United States (and possibly the world). The movie has been a long time coming, and the more I see, the more I want to see. 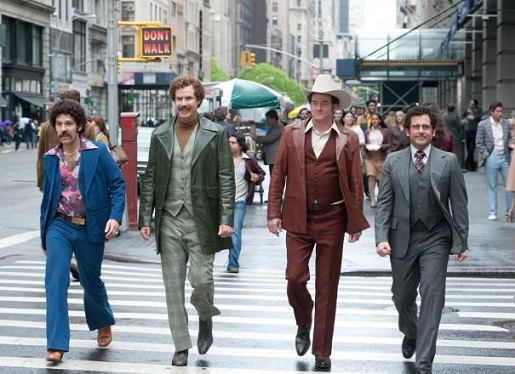 Paramount has rolled out a new trailer for Anchorman 2 – The Legend Continues. It’s also the first international trailer for the film, and it shows a little more of the comedy and details a lot less of the plot than you might expect. Not that you’d expect, or even need, a plot. Check out the trailer for yourself! It looks like Anchorman 2 is going to end up being really funny. If they haven’t given away all the funny bits in the trailers or in Ron Burgandy’s forthcoming book, then I’ll be there to see this movie when it opens. If it’s half as good as the original, I won’t be disappointed. Maybe they filmed enough hot news action to craft a second film out of the leftovers, like they did during the filming of the first Anchorman.